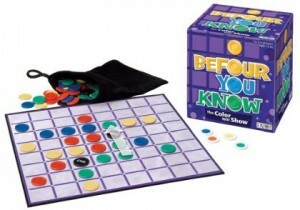 From Patch Products, Befour You Know is a multiplayer Connect Four type game with tokens in four player colors and one wild color. Players’ colors are secret, so that when they draw a token from the bag and place it on the board, what they’re trying to accomplish can be a puzzle to figure out. Someone will have 4 in a row before you know it. And then the game is over. Too bad.